“I was driving to work after having dropped off four kids at St. Raymond’s. As I passed by Fremont Park, I noticed the flag pole was down and being shoved around by a small tractor. ‘That is such a shame,’ I thought to myself, and turned around and drove back to the park. “I talked with a supervisor who told me he had instructions to remove and destroy the flag pole, that it was scheduled to be cut up in the next hour. I asked if it would be okay for me to take it if I hauled it away, to which he replied, ‘Absolutely!’ I went to the office, picked up a co-worker, and contacted a landscape maintenance friend of mine. We rounded up five more guys and went back to the park. “We tried to pick it up, but no go. We left those five at the park while we rounded up five more guys. When we got them back to the park, we were able to move the flag pole, carrying it the approximate 1.5 miles to my home in Atherton. 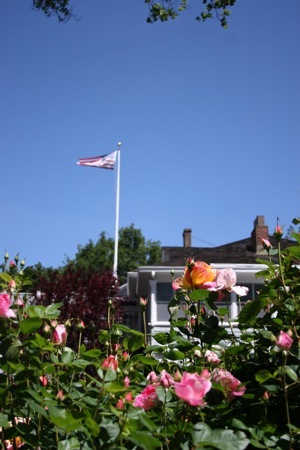 Top photo courtesy of Rory Fuerst; flag at its new home (with flowers in foreground) by Laura Pitchford.